One of my earliest emblematic accomplishments was the building of a stairway in a barrio of Caracas, just months after graduation from Harvard, when I was a community development volunteer in ACCION en Venezuela (now ACCION International). This is something that has made and continues to make life easier for many people, and was a defining event for my life. Like every truly important accomplishment, this involved an entire community. On that Saturday in August, 1963, I was the only foreigner in a work gang of men of the barrio, swinging buckets of cement mix to our shoulders, climbing the steep slope to dump the mix into the topmost frame, and then stumbling back down, hour after hour. Probably the pobladores of the barrio would have got something like it built without me, eventually. Without it, life for anybody — mostly the women — who had to carry water or groceries or small children to houses up the slope had been almost impossibly difficult, especially in the rainy season, but as obvious as the need was, it was not easy to get the diverse groups, including people who might never need to climb that particular stairway, to cooperate in such a big project. I had helped organize the action — in my incipient Spanish — and had got the donations of materials, and thus made it happen a little sooner and easier than it might have. And like every life-defining event, this has taken on exaggerated proportions in my memory as a personal myth. In my roughly year and a half in Venezuela I worked on various community projects, including other stairways. And since then, I’ve written books and articles on sociology and politics, taught, and taken part in social actions (pro-civil rights and anti-war movements, a citizens committee to save lives in Chile after the 1973 coup, etc. ), and later began writing fiction to help us imagine all these things. But this first operación cayapa, a muscle-tearing but almost festive volunteer community project in the compact cluster of huts clinging to the hillsides of barrio Antonio José de Sucre on the road to Guarenas in Petare, the rough eastern edge of Caracas, Venezuela, was my initiation. I went back, years later, to see it, and found one of the men who had worked with us that day —Toribio Blanco, a large, smiling black man who was one of the key movers of the project. We embraced and mumbled things about all the time that had passed and looked at the stairway, on the opposite slope from his house. It was getting heavy use from people who probably never think of of the labor it took to build it. And that pleased both of us. For Toribio and all who live there, I know the barrio has many other meanings and memories. But I am still hauling cement mix up that hill. Still climbing to get a better view, still hauling whatever it takes to make our lives a little easier, still trying to get that stairway built. 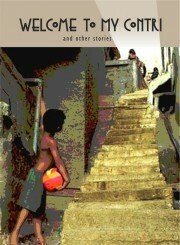 And that is why a barrio stairway figures on the cover of the new (2012) e-book edition of my short stories of Latin America, Welcome to My Contri.